In order to start generating wind energy at a larger scale, the Department of Energy is aiming their sights high. They’ve recently contracted Sandia National Laboratories to design a 50-megawatt offshore wind turbine capable of functioning in hurricane-speed winds. Each blade would extend 650 feet, which is more than two and half times the length of any wind blade currently in existence. In order to keep a structure of that scale stable in extreme weather situations, Sandia plans to employ some clever design tricks borrowed from nature. 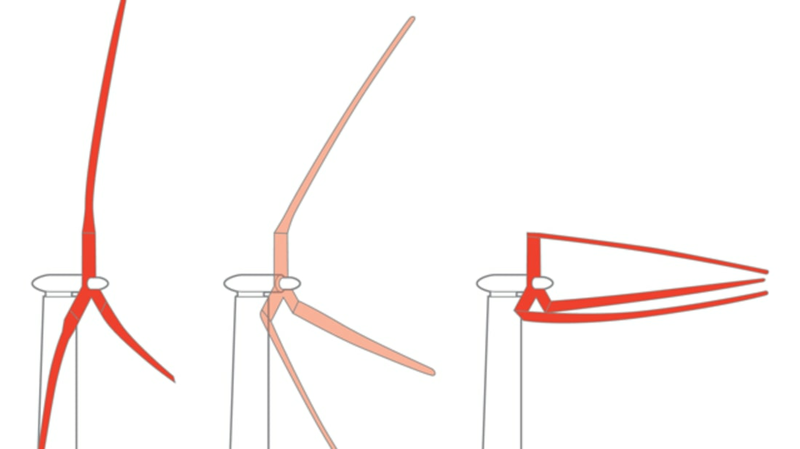 The "exascale" turbine will be supported by a lightweight, segmented pole that yields to high winds to keep it from snapping in two. The blades themselves will be segmented as well so they can collapse safely when battered by hurricane-force gusts. The design was inspired by palm trees, which are able to survive severe storms by bending their trunks and folding their branches to align with the wind. On a calm day, the entirety of the turbine’s 1300-foot blade span would be extended to generate the maximum amount of wind energy. The massive wind turbine is just a concept for now, but large-scale designs like this one could eventually help the DOE meet their goal of bringing the nation’s energy usage up to 20 percent wind power by 2030.